In 1956, two sports cars were taken to the Bonneville Salt Flats in Utah as part of Donald Healey's dream of travelling at more than two hundred mph. 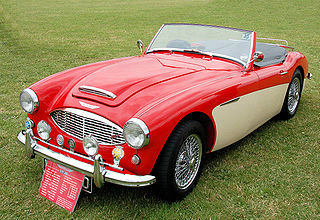 The first car was based on a 1954 Austin-Healey BN1, powered by a supercharged, 2639 cc, BMC C-Series, 6-cylinder engine with a four speed gearbox. Owing to its shape, it was known as the "Streamliner". In fact, this engine, in its standard form, would power the forthcoming Austin-Healey 100/6 sports car. The supercharged engine was modified by Austin until it had developed 292 bhp at 5000 revs. At this point, they were confident that the car was capable of reaching 217 mph. One weakness of the car was its bevel rear axle which, owing to the extreme power generated, could fail if the car accelerated too fast. Before being dispatched to America, the car received extensive aerodynamic testing in a wind tunnel. 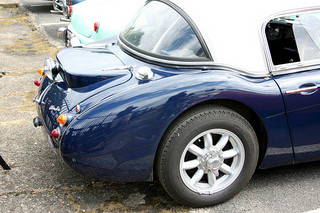 As a result, it was agreed to remove the car's 1954 rear fin in order to improve stability. On 9th August 1956, during the first test run, as the car reached 200 mph, the supercharger failed amidst a huge explosion. After receiveing replacement parts from England, the car was repaired at a local service station. On 21st August, Donald Healey set off on the first of two compulsory runs, one in each direction. During the first run, he achieved 204 mph before the supercharger, once again, blew up. After quick repairs, he reached 197 mph on the second run which gave him an average speed of 201.1 mph. He had achieved his dream of reaching 200 mph. 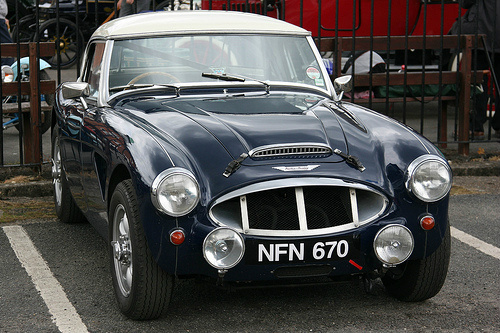 The second car taken to Bonneville in 1956 was known as the Endurance Car, and was an Austin-Healey BN2 sports car fitted with a long nose. It used a standard 2639 cc engine with a six port head, three twin choke Webber carburettors, a compression ratio of 10:1, and developed 160 bhp. However, further development on it raised the output to 164 bhp at 5500 rpm when running on a mixture of equal proportions of methanol, benzole, and premium grade petrol. On 9th August 1956, when engine testing began, problems with vapour lock caused the trials to stop. On 14th August, further problems with misfiring were encountered. Subsequently, with problems resolved, the engine was fitted into the body, built by carmakers Jensen, with the cockpit adapted to resemble a single seat racer. Carroll Shelby and Roy Jackson-Moore, between them, broke the 150 mph barrier with the Endurance car. The two record breaking attempts were conducted to coincide with the launch of the new Austin-Healey 100/6 sports car in September 1956. 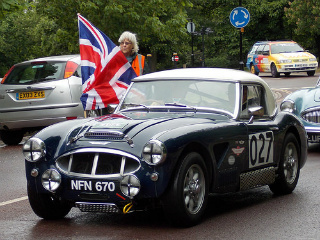 The Endurance car was painted in the two tone colour scheme of Healey Blue and White, and sported an oval grille with wavy horizontal bars that were to be incorporated in the forthcoming launch. The 92 bhp generated by the basic C-Series engine was regarded as insufficient to power the new 100/6 especially since its predecessor, the 100/4, produced 90bhp, and was some 330 pounds lighter. Consequently, as a result of further work on the engine, output was increased to 102 bhp at 4600 revs. This initial version of the 100/6 BN4 sports car had only two inlet ports which, combined with horizontal 1.5 inch H4 SU carburettors, made for difficult engine breathing. Although 0-60 mph time was less than that of the 100/4, the new car had a much smoother engine, with good mid range torque, which made for effortless long distance high speed driving. In late 1957, the BN4 sports car received a new cylinder head with a six port aluminium inlet manifold, and two larger 1.75 inch HD6 SU carburettors. Together with larger valves and a compression ratio raised to 8.7:1, the engine now developed 117 bhp at 4700 rpm, with an improvement in both acceleration and top speed. This six port head was the result of the 1956 record breaking cars. 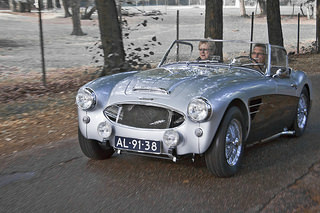 In 1956, the 100/4 BN2 sports car was phased out just as BMC was in the process of rationalising its range of engines as follows: A-Series being 850 cc, B-Series being 1500 cc, and C-Series being 2600 cc. Since the Austin A90 and Wolseley 6/90 saloon cars were currently using a C-Series, 6-cylinder engine of 2639 cc displacement, it was suggested that this unit could replace the existing 2660 cc, 4-cylinder unit used in the BN2. Since the new 6-cylinder engine was larger than its replacement, a bonnet scoop was added in order that the radiator, which had now been moved forward, was clear of the bonnet. Furthermore, in order to extend the appeal of the car, Donald Healey added two occasional rear seats. As a result, it was necessary to increase the length of the chassis by two inches. The 2+2 version was discontinued in early 1958, and was only offered as an optional extra, since the two seater version became the more desirable. Apart from 284 units built with right hand drive for the home market, all 100/6 production was exported to the US. In the latter part of 1957, the manufacture of the BN4 moved from the Longbridge factory to the MG facility at Abingdon. Production of the BN4 sports car ended in 1958, when it was replaced by the two seater, 100/6 BN6 variant. 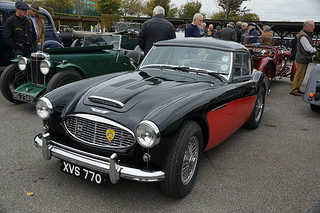 A 1956-59 Austin Healey 100/6 BN4 in excellent condition would command anything between £35,000/$55,000 and £40,000/$64,000.